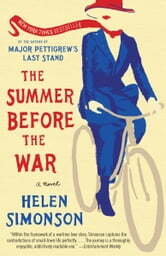 **New York Times - bestselling author Helen Simonson returns with a splendid historical novel full of the same wit, romance and insight into the manners and morals of small-town British life as her beloved Major Pettigrew's Last Stand. It's the summer of 1914 and life in the sleepy village of Rye, England is about to take an interesting turn. Agatha Kent, a canny force for progress, is expecting an unusual candidate to be the school's Latin teacher: Beatrice Nash, a young woman of good breeding in search of a position after the death of her father. (Never has there been a woman Latin teacher.) Agatha's nephews, meanwhile, have come to spend the summer months, as always, both with dreams of their own: Daniel, the poet, to publish a literary journal in Paris, and Hugh, to graduate from medical studies and marry his surgeon's daughter thus inheriting a lucrative practice. But then Hugh is sent to pick up Beatrice from the train station and life, of course, changes. As with Major Pettigrew's Last Stand, the quintessential English village becomes the stage on which entrenched tradition, class, ignorance, family ties and love play out. Here, these characters and others we come to love and root for become characters we hope and pray for when the shadow of the Great War looms ever closer to home. It’s the summer of 1914 in East Sussex, England. Young Beatrice Nash arrives in the small coastal town of Rye, mourning her father’s death and hoping to land a position as a Latin teacher since she is now penniless, but she was raised to think for herself and may stand out in Rye…and not in a good way. Hugh Grange is home from his studies to become a doctor to visit with his uncle, who works in the Foreign Office, and his aunt. Hugh and his cousin befriend the young teacher, helping her make her way in Rye’s social circles. It is a summer filled with expanding horizons, facing the harsh realities of being a single young woman in late Edwardian England, learning the social steps in a small town, discovering boundaries, stretching boundaries, facing a war and all its pain, and falling in love. I thoroughly enjoyed this book, rooted for the characters, ached for their pain, cheered for their joy. Ms. Simonson has a way of drawing you in to each one’s dilemmas and desires…making you really care about each one. Beautifully written, with attention to details that draw you into the time and the place, The Summer Before the War is a story that will stay with you beyond when you close the cover after the last page is read. Five stars! This book was absolutely delightful. It was a wonderful collage of love story, issues related to women’s equality, being gay in an unaccepting world, the impact of war on our lives, and so much more. It is the most enjoyable book that I’ve read since reading “A Gentleman in Moscow.” It just flows with the richness of an earlier time, and the ideas intertwine beautifully. It was recommended on Fareed Zakaria’s program GPS of all places, and I’m the richer for having read it. This book was a little slow to start, but I couldn't put it down. Although there are a number of characters each one is developed well and introduced in an elegant manner. The overall storyline is rich with detail and is in constant motion. Well worth the read.